Hello ... Hello ... my old friends ... It's great to see you once again! Did you know that The Electric Light Orchestra [ELO] made their live debut in Croydon some forty three  years ago today on Sunday 16th April 1972? 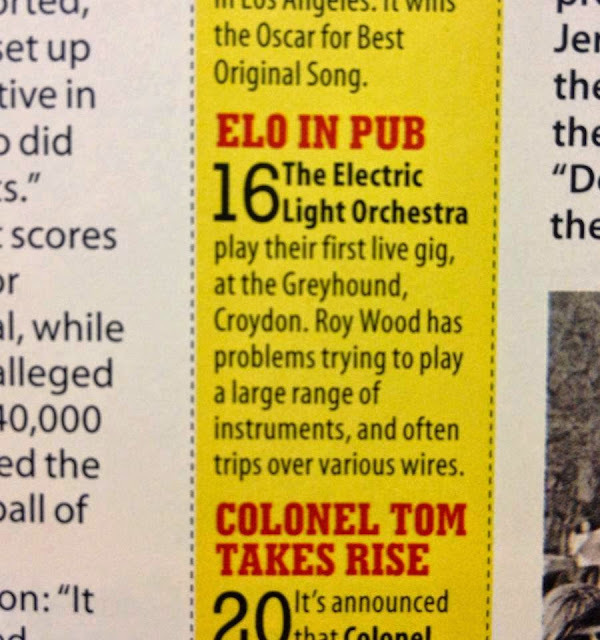 However, there does seem to be some "Confusion" in some quarters as to whether the host for ELO's first ever live outing was either The Greyhound or The [Old] Fox & Hounds or even The Fox at The Greyhound - according to one gentleman who was actually in the audience that night! "ELO IN PUB" ... but which one? The Official Jeff Lynne Facebook page stated today that the gig was at The Fox & Hounds in West Croydon whereas several other sources including Wikipedia, press tour adverts of the time [see below] and personal recollections etc. state that The Greyhound is the widely accepted actual venue. There have always been contrasting reports of that very first ELO gig out there in the ELO fan base but the above press clip entitled "ELO IN PUB" still brings a smile to my face as I imagine Roy Wood jumping from guitar to oboe whilst trying to avoid the many trip hazards on stage! ELO Beatles Forever [ELOBF] wishes to extend a big "THANK YOU!" to Roy Wood, Jeff Lynne, Bev Bevan, Richard Tandy and the entire ensemble of ELO musicians then and now for birthing and/or contributing to such a magnificent band - wherever that first gig actually took place!